If you haven't heard about it, there are places in Europe where you should be extra wary of pickpockets. Barcelona is definitely one of them. Yes, I am biased. That is because it was where I lost my bag with 2000 pictures in my brand new Canon digital camera, 800 videos in my camcorder and my mobile phone along with other less important belongings. Not to mentioned it happened right after we happily got there from Paris as a just engaged couple who had recorded our engagement speeches and taken countless lovey-dovey pictures on the Eiffel Tower. How the thief managed to grab our bag without us even realising during a meal of KFC, I will never know. Blame it on the finger-licking good chicken and how it has always been my favourite fast food chain. So when we got a second chance to revisit Barcelona during our MSC cruise around the Mediterranean, I won't say it was a dream come true but more of a sweet taste of revenge to set foot in the city once more and take pictures of this place that once broke my heart, left me with a loving then fiancé who had to piggyback my sad soul home, and let me spend a night at the police station playing charades with the Spanish officers when I should have been out clubbing. The best thing about coming back is that this time round, I had Angel with me. A little childish to think, but it's like "Haha, you took my bag and left me with nothing. But now look, I have a baby and my life has never been better!" Barcelona has always left a impression in my heart as one of the most beautiful European cities with awe-inspiring architecture. 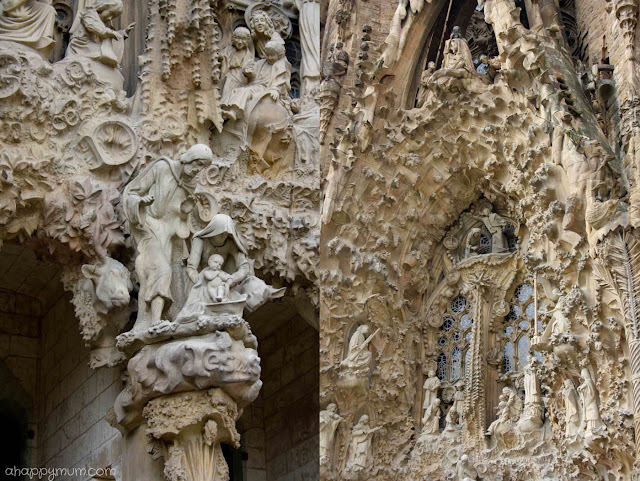 I was very much intrigued by the works of Antoni Gaudi, whose works had a very distinctive style and he had the nickname "God's Architect". 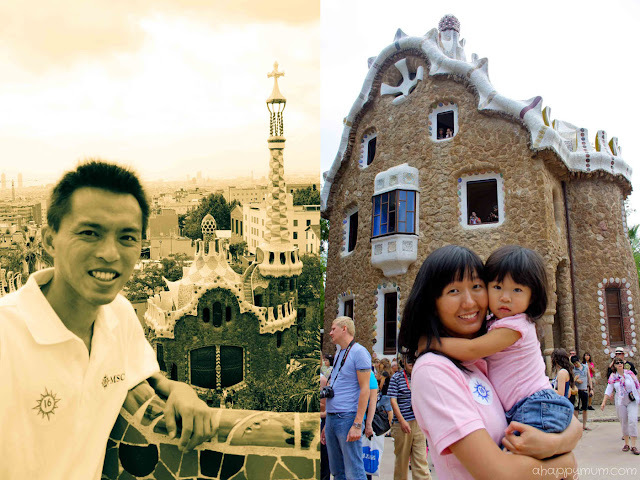 Since we only had half a day to spend in this time round, we decided to embark on a tour named Gaudi's Experience which will take us on a drive past Casa Batlló, Casa Mija and let us have the opportunity to visit two of our most memorable places - Park Güell and Sagrada Familia. Beware! This was the exact KFC where we got pickpocketed. 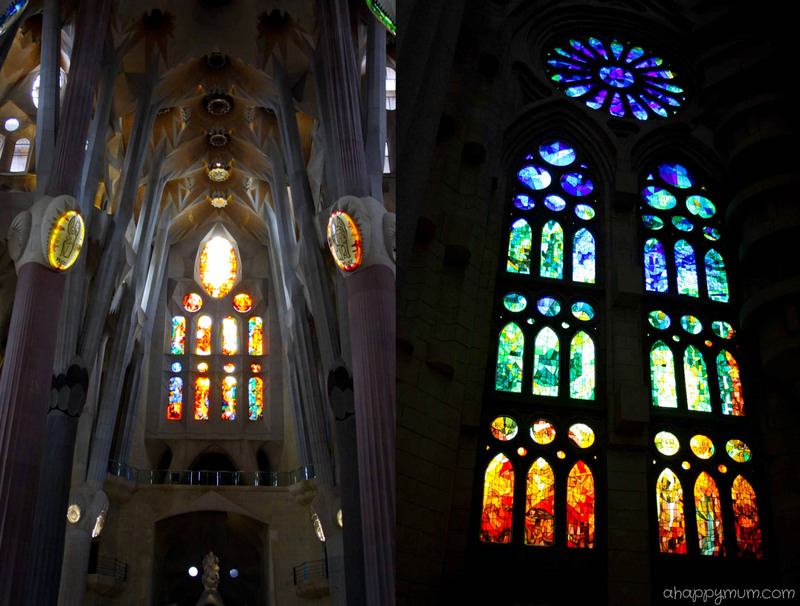 It's the one right beside Sagrada Familia. Grrrrr. Sagrada Familia, hailed as Gaudi's magnum opus, is notably one of Barcelona's most popular tourist attractions. Although it is an unfinished masterpiece and work will continue for at least another decade, it is already the city's most important landmark. Thinking about it, work on the church started from 1882 and is slated to complete by 2030, which is nearly 150 years! According to Gaudi's original design, there will also be 18 spires (8 had been completed by 2010) which upon completion, will make Sagrada Familia the tallest church building in the world. It was actually quite a sight to see a world-famous attraction which was still undergoing construction, probably what makes the attraction one of a kind. 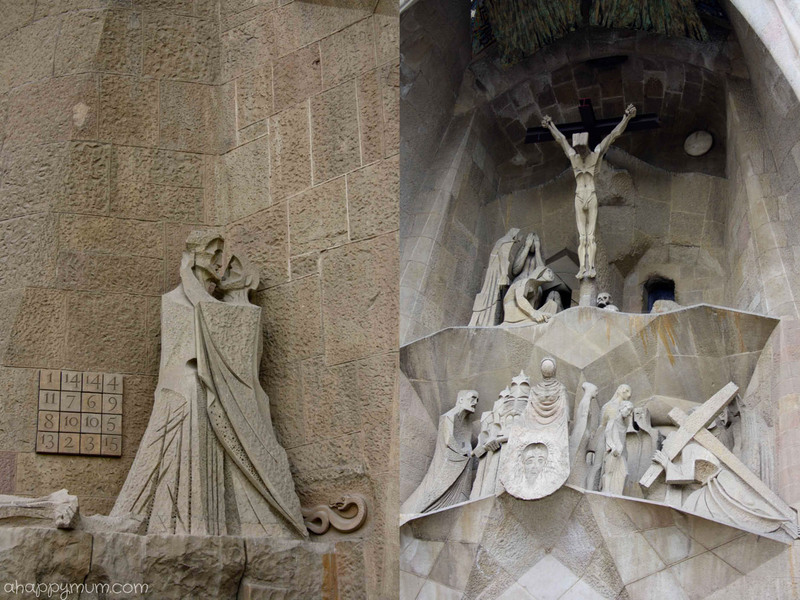 When completed, the Church will have three grand facades: the Nativity facade to the East (the only one finished by Gaudi himself), the Passion facade to the West, and the Glory facade to the South, of which the last is yet to be completed. Looking at all the intricacies of the building exterior, it was enough to make every tourist stop and stare in admiration. The columns in the interior, a truly unique Gaudi design using intersection of various geometric forms, are designed to mirror trees and branches. In fact, the design is detailed on so many levels that none of the interior surfaces are flat but full of curvaceous embellishments. Moving on from Sagrada Familia, where the three of us almost missed the bus because we somehow got split up from our group, we were on our way to the last destination for the day - Park Guell, one of the world's most famous and intriguing parks. This building above is the Gaudí House-Museum which was the residence for Gaudi for nearly 20 years and subsequently turned into a museum. The focal point of the park is the main terrace Gran Placa Circular, which is surrounded by a long bench in the form of a sea serpent. The colourful ceramic serpentine bench, which was then known as the world's longest bench, twists snakelike around the plaza. It was said that to design the curvature of the bench surface, Gaudí used the shape of buttocks left by a naked workman sitting in wet clay. There are two striking buildings at the entrance to the park which cannot be missed. 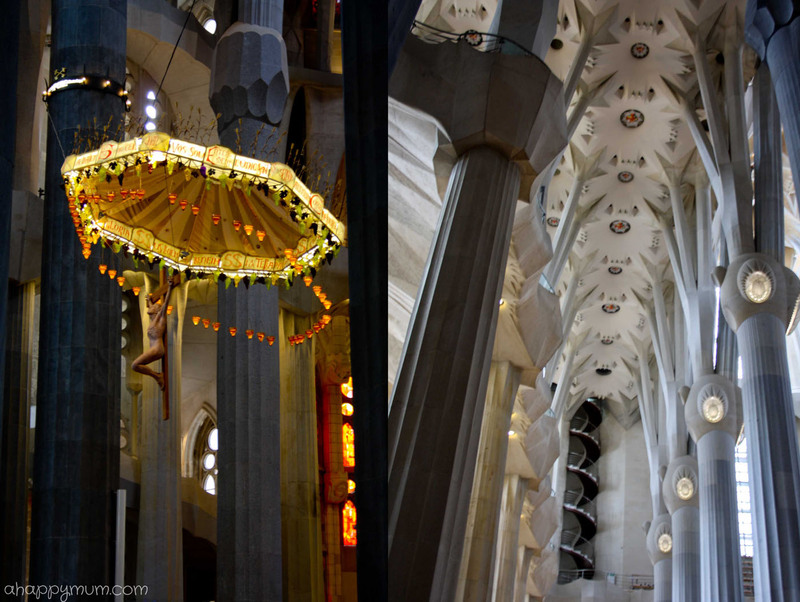 These are pavilions, designed by Gaudí, with curved roofs covered with brightly coloured tiles and ornamented spires. Don't they look as if they are taken out of a fairytale like Hansel and Gretel? 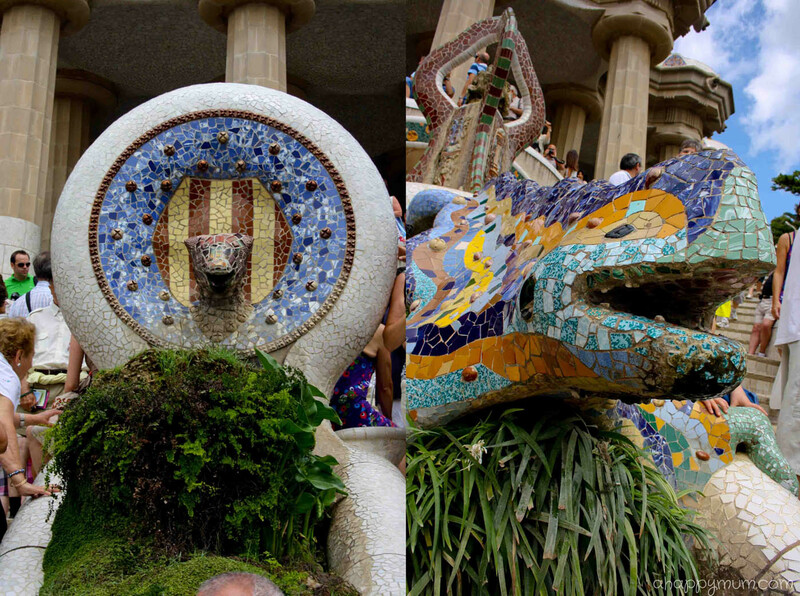 The multicolored mosaic dragon fountain, which looks more like a lizard, is located at the main entrance and is the best symbol of Park Guell. To get a good picture of it when there are hundreds of other tourists trying to do the same thing, well, it was virtually impossible for us. We also managed to catch a Flamenco dance which made Angel started to boogie too. If you are a fan of America's Next Top Model (Yes I confess I am! ), you probably also remember Park Guell in Cycle 7 where Caridee and Melrose marched it out here in the finale runway show. 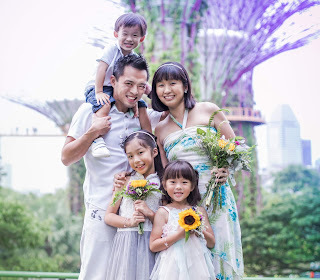 We had some time to spare before returning to the ship so we decided to do a "Garden Special" for Angel because the flora and foliage just looked too pretty as a backdrop. Angel: Mummy! This is my photo shoot, right? Why you come in? Mummy: Just one picture lar, darling. 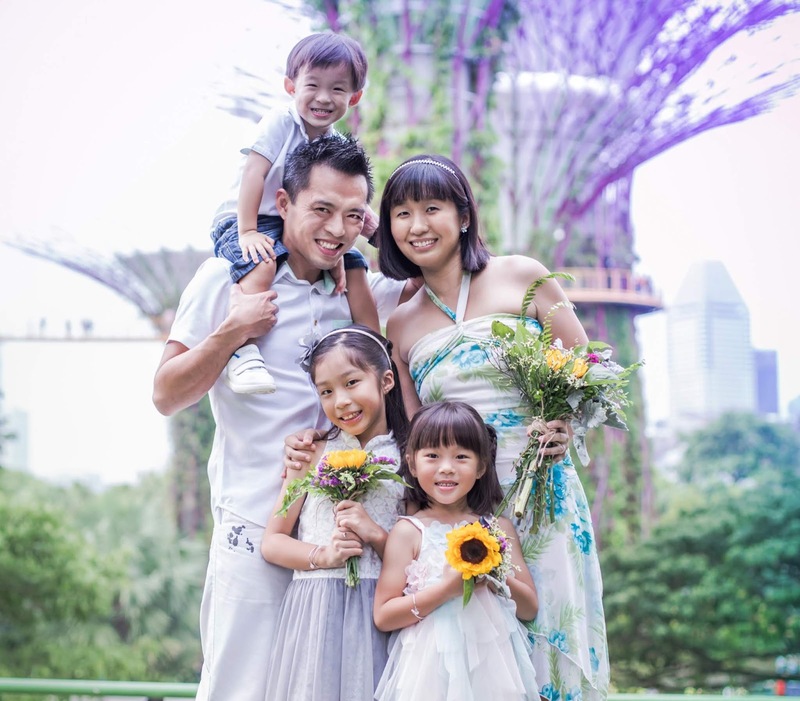 Mummy also want to be pretty like the flowers. Angel: You see, now the picture is not nice already. Mummy: Don't care. Ready? 1, 2, 3, Smile! To my beautiful girl and to beautiful Barcelona, thanks for all the wonderful memories and a cherished second opportunity. Oh yeah, stupid but smart thief. Grrrr. I'm so glad I made new ones too, thanks Ai! 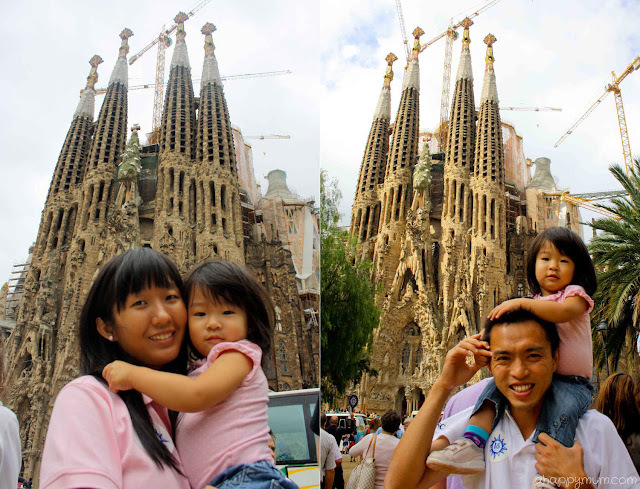 My gf was pickpocketed at Gaudi Park. I was extremely cautious when I visited. Oh dear, sorry to hear that too. It's way too common, I'm glad you kept your valuables intact!